Lantern fruits in Antarctica? Fossil ancestors of tomatoes in the ice? Home → * Antarctic News → Lantern fruits in Antarctica? Lantern fruits in Antarctica? Tomatoes, potatoes and tobacco from the big ice? According to the online news section of the magazine Science, US-American and Argentinian researchers have found fossils in Patagonia, Argentina, that belong to the nightshade family, as today’s tomatoes, potatoes and tomatillos. These plants lived more than 50 million years ago in a warm, humid climate, when South America was still very close situated to the Antarctic Peninsula. The Drake Passage did not yet exist. Instead, a shallow shelf sea separated the Pacific Ocean from the Atlantic and South America from Antarctica. At the same time, the border between the subtropical climate zone and the temperate climate zone went across the Antarctic Peninsula. Before the Antarctic continent got covered by snow and ice, it might well have been that these ancient ground-cherries also grew in Antarctica. With the drastic climate change towards the ice conditions already on the horizon, Antarctica did not become a lantern fruit place. In contrast, it is by far the most hostile continent on the planet and not your place at all if you are a tomato. Lantern fruits in Antarctica? 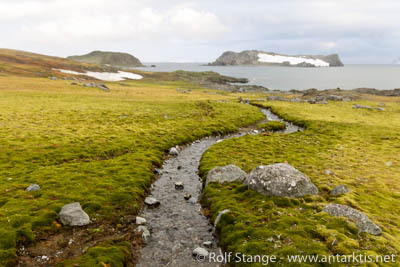 No, only mosses (Aitcho Island, South Shetland Islands).